Individuals with type 2 diabetes mellitus have a high residual risk of cardiovascular disease (CVD) despite maximal statin therapy and lifestyle interventions. In addition, adults with diabetes frequently exhibit the pattern of elevated triglycerides, small dense LDL, and reduced levels of high density lipoprotein cholesterol (HDL), also known as diabetic dyslipidemia. The role of combination therapy with an additional agent such as niacin, ezetimibe, fenofibrate, and n-3 fatty acids have been extensively studied with disappointing results. 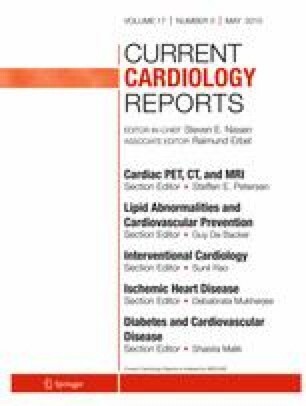 Review of key trials assessing benefit of combination therapy to reduce CVD risk from dyslipidemia is performed. While combination therapy frequently results in an improvement in lipid profile, to date, no consistent improvement in clinical outcomes has been observed. Therefore, current guidelines do not recommend combination therapy in individuals with diabetes, highlighting the role of intensifying statin therapy and lifestyle interventions. The recently released The IMProved Reduction of Outcomes: Vytorin Efficacy International Trial (IMPROVE IT) demonstrated a small but significant improvement in clinical endpoints with addition of ezetimibe to statins in high-risk patients. Although this trial was not specifically targeted towards patients with diabetes, the results may influence the future role of a combination therapy in such a population. Haider J. Warraich and Jamal S. Rana declare that they have no conflict of interest. Nathan D. Wong reports grants and personal fees from Amgen, Regeneron, and Bristol-Myers Squibb.